"Guys, I need you to do me a little favor." It was a small gallery, dusty, dark and forgotten between two huge houses in the middle of Neopia Central. Not many Neopets managed to find the narrow door that led there and even if they did, they rarely noticed Tsuki, the Shadow Shoyru who kept the place in order and also lived there. Even though Tsuki's family had a perfectly good house in Mystery Island, the Shoyru liked the gallery's solitude better and was happy enough when his siblings came to see him every once in a while. Now two of his brothers, Shad the Lupe and Saura the Zafara had stepped in on their way to the Lost Desert to do some shopping. "If it involves finding you some rare and possibly acidic potion for some of your weird tests, then I'm not in," Shad stated, knowing his stepbrother well enough. Tsuki was a mage and alchemy was only one of his many hobbies. Tsuki laughed. "No, no. I just promised a friend of mine in Sakhmet's Royal Library I'd send him some spellbooks. I managed to get two extra copies some months ago and don't really need them. Once you're going that way, maybe you could take them along; they don't weigh much…?" The two brothers exchanged quick glances. Spellbooks were just as dangerous as acidic potions. Some of them had the tendency of reading the reader back. Some ran around at night. Some blew up every once in a while for no obvious reason. "These ones are pretty harmless," the Shoyru assured them, seeing their hesitation. "They do nothing when stuck in a leather bag. Will you help me with that then?" "I'm telling you, this thing will blow up the minute we stop suspecting it," Shad grumbled, peering at the bag Saura carried on his shoulder as the two left down the wide main street of Neopia Central. It was a beautiful day, though cloudy, and the southern wind brought vague touches of the Lost Desert's sand to the Lupe's sensitive nose. "Tsuki knows what he's doing," Saura claimed, adjusting the bag's belts a little. "When he says that the bag is strong enough, then it is strong enough. Let's step on it now; it's a very long way." The two accelerated and trotted quickly down the road. They were stepbrothers - Saura was adopted - and hadn't really gotten along at first. The shadow Lupe, though friendly and happy-go-lucky for most of the time, had stated that there was no way he was going to tolerate some sissy Zafara who looked like he had been kicked out from M*YNCI. Saura on the other hand, though peaceful by nature, was sarcastic and tough enough not to let the Lupe get to him. After spending countless days nagging each other, the two eventually got so used to each other that they became inseparable buddies. Predictably enough. "The journey will take days," Saura remarked. "You think we'll be back by Gadgadsbogen?" "Don't scare me," his brother snarled. They had already spent a week traveling from Mystery Island to Neopia Central and the Lost Desert was equally far. But as they both considered their home island too boring to spend more than a month in a row there, they didn't mind running around every now and then - unless they were actually on the road, hungry and tired. Once again, predictably enough. "I think I once read about a shortcut," the Lupe muttered hesitantly as they left the Central and turned towards south. "Somewhere near the Haunted Woods… a few miles past Kiko Lake. It was a place called…" he muttered to himself for the next fifty yards, testing the sound on the word on his tongue, "'Alveree'? 'Altestee'? Something really weird-sounding like that. Possibly a very old place, forgotten and stuff." Saura glanced at him with curiosity. "Where'd you hear that? I didn't know you read old geography books like these." As Shad shrugged in his trot, the Zafara frowned. "Now that you tell me, that word sounds familiar to me too… 'aldersee'? Or something? No idea… do you remember where exactly that shortcut is?" Shad blinked in confusion. His brain felt… dizzy. He gave a short suspicious glance towards the leather bag the spotted Zafara was carrying. "Let's go towards Kiko Lake and see if we manage to find it. Can't be that far, I think." The northern border of the Haunted Woods wasn't that far; it only took them about three hours to get the dark line of trees looming in the distance. The sharp snowy mountain peaks, lost in the hazes of fog and who knows, perhaps some long lost threads of magic, could still be seen far behind the trees. There was a meadow in front of them, not really inviting, though it was nothing but a wide plain. How a plain managed to look that ominous was beyond the two. "No wonder that people don't really know about this shortcut," Shad muttered. "Doesn't look like a shortcut to me," Saura stated grimly. "We've already ventured farther west than we should have. Where's that shortcut supposed to be in here? Through the woods?" The shadow Lupe shook himself, looking a bit confused. "I have no idea. Should be. My memory is hazy right now. But I know that it should be in there somewhere." "Let's go then," Saura said and the two crossed the dark meadow. The sky was still cloudy, though there was no wind. The woods were even quieter; only the quiet rustle of leaves and small branches was to be heard. 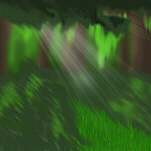 The center of the Haunted Woods was farther south so the forest was more peaceful and less ominous in this region. The canopies waved above their heads as they entered a narrow path between the trees. Saura gave a final glance towards the meadow over his shoulder… and froze in the middle of the step. The Lupe looked back as well and his yellow eyes widened. The two ran out of the forest and looked around. The meadow had turned into a complete prairie. The mountains were far away and the Haunted Woods were all of a sudden bigger, darker and grimmer. The trees looked old, literally ancient. And when Saura squinted towards the distance, he could clearly see a stronghold. "Oh boy," Shad stated with his ears drooping. "It's the Meridell syndrome. We've landed in the distant past!" Zafaras have good eyes. Saura tried harder to see better. "Then it's an even more distant past than Meridell's existence as that fortress seems ancient. But it can't be a time warp. Look around. The land has… spread out somehow. Like a crumpled piece of paper that got stretched out as soon as we entered the woods." "How do we get out?" Shad sat down, looking at the odd land they had run into. Saura sat down too, looking around with vague nervousness and, as the Lupe noticed, quite a bit of curiosity. "You know what I think?" he finally asked. "It's a piece of dimension that got crumpled together like that sometime long ago and is constantly sitting here, forgotten by the rest of Neopia as nobody ever ventures here… then how did you know about it anyway?" They exchanged glances. Then turned to look at the leather bag. "I swear to Fyora, one fine day that Shoyru will hear a few things…" the shadow Lupe snarled, digging the tomes out of the bag. They seemed completely harmless when the two opened them but both, having known the world of magic long enough due to their stepbrother, knew very well that spellbooks often leak magic. If the magic is strong enough then leather only helps at certain occasions. And the books were obviously old, like all good spellbooks. The two bowed over the yellow pages. Two minutes passed in complete silence. "You can't read that either, eh?" Shad asked grimly. "I'm no mage, okay?" Saura grumbled, sitting up and flipping the pages. "I can recognize some words but the writing is so odd… hello, what's that?" The two looked at the object that had appeared between the pages. "It's a Star Compact Mirror," Shad said, raising his eyebrows. "I didn't know those were magical." Saura turned it in his hand. "I don't think it is. Remember that Phila recently complained that her mirror got lost?" Phila was their little sister. "I guess this is the one. She goes to the gallery all the time and fools around there, she probably stuck the mirror between the book and forgot all about it." The Lupe nodded slowly. "You may be right. Okay, open it. Let's contact Tsuki and see if he can help us." Saura glanced at him in confusion. "Say what?" "Everything that's been held close to something magical starts acting funny. Everything that's been to some place for a while becomes a piece of that place and when it's taken away, a part of this place is taken along." 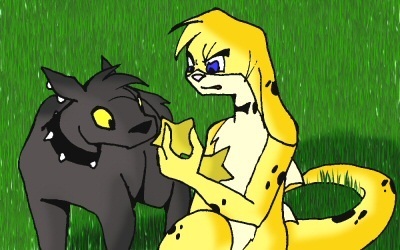 Shad rarely talked that seriously but Saura knew him well enough to know that the Lupe, though seemingly an airhead, had a lot more common sense than many of his siblings. "Fine, let's try," he said, opening the mirror. "If I had any idea how that's supposed to work… Tsuki! Tsuki, can you hear me?" The mirror went blurry, then all of a sudden wet and then their stepbrother's surprised voice emerged from it. "Saura? Ever since when do you know about mirror magic?" "Got lucky," the Zafara grumbled, leaving Shad's theories for another time. "Listen, we got stuck in some odd piece of land, or dimension, or something towards the matter… I think that those books you gave us leaked magic and told us where to go." There was a quiet sigh from the other side of the hazy mirror. "I'm sorry, I didn't see that coming. Apparently the versions I gave you have some extra pages and aren't exactly the same as my copies. But I'll check my books and see what I can find… I've read about the place a little. It's like a crumpled piece of paper, right? Small on the outside, big on the inside?" "Exactly," Shad said by his brother's side. "What is this place?" Tsuki frowned - it was easy to understand even though they didn't see him. "I don't remember. It's not all that safe, so be careful… but it's not impossible to get out, that I know. Just cross the land, when you reach the border, you'll easily step out. It only takes longer than it would've taken you to cross these lands outside the place you entered." "But it's not safe," Saura said. "True," the voice in the mirror agreed. "Be careful, guys. I'll see what I can find. Go ahead now, I can't talk any longer. That mirror magic always gives me a gigantic headache." The mirror, though still wet, became clear again and Saura stuck it in the bag along with the books. "Let's go then," he said, getting up and looking around. Shad got up too, sniffing the breeze coming from the strange stronghold in the distance. "It's not empty, that much I can tell. Should we go through the woods? I personally don't like the idea of being spotted from some fortress." Saura nodded. The two looked around once more and disappeared into the woods. The narrow path led straight into the forest. It hadn't been used often; it looked more like a path made by wild Unis.